« Ode to a great dog trainer at OhMyDog! Pick it up if you’re curious about language learning in dogs, or if you’re a Border Collies afficionado. Or if you just want to relax to an informative and entertaining book about dogs. I for one loved every page! 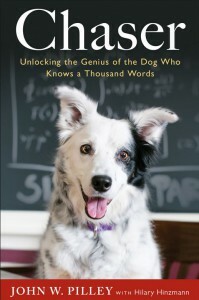 This entry was posted in Dog writing and tagged animal language learning, animal scientist, border collie, chaser, creative learning, dog book, dog book review, dog cognition, dog language learning, dog learning, dog training, john w pilley, rico. Bookmark the permalink. Post a comment or leave a trackback: Trackback URL.